This had been on my “to purchase” list for years and I have no idea why it came to mind, but it did, I did, and was so glad. This isn’t Shakespeare, but McCammon’s second best for me (after the amazing SWAN SONG which I read decades ago but have never forgotten). Here we have a marginally successful touring band...you know the type - never hit the bigbtime and likely won’t. Now they are on what is likely their last outing in their current incarnation, but someone, or something seems to be after them. Who or what? And why? Despite a few incredibly stupid actions by the characters toward the end (and by then McCammon had made me like them all so much I suppose I was willing to forgive them....even the FBI agent who would have NEVER allowed such a thing), the book creates a real family of this road band and perhaps its real success lies there - showing the banalities and heartbreak which makes up the reality of 99% of the bands that tour in America. The murders, while an interesting plot point, bring them even closer together and the book is well written and a quick, enjoyable read. Glad I finally got to it. Not as good as "Boy's Life" or "Gone South" but interesting. I do think there are parts that tend to go on and on a little to long and you start to lose focus on what the original thought was, however, there is so much going on in this story. This book will make you think about what our Vet's go through, both in combat and perhaps worse, when they return home, the way they are perceived, and the lack of understanding on the parts of those who could not possibly understand what they have been through, and in their constant struggle with the devils that follow them around, and the voices in their heads. The Marine Sniper in this book needed a purpose, a mission, after all, that is what he was trained to do. Then by chance he sees a group, "The Five", on TV one night who happen to say the wrong thing at the right time and our Sniper, "Jeremy", suddenly has a new mission. 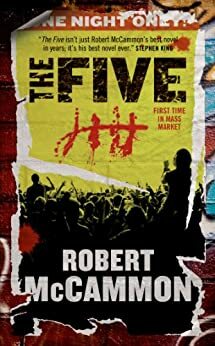 "The Five", is a struggling rock group from the Austin music scene who finds themselves the target of an ex Marine Sniper. Enter an FBI agent who is a retired Marine assigned to protect the Band but also believes in the brotherhood of the Marines. How much can one song affect your soul and perhaps bring about changes that you did not have the courage to jump into on your own, then for some reason, "The Five's" song had the words that gave you the courage. Perhaps "The Five" would never know how many people their last song affected and caused those same people to make a change in their life. I believe one person who commented said "to have patience when reading this book". I agree. Stick with it. This book reminds me of the best of Stephen King, plus there is much more going on. The story itself, a sniper goes after the members of a small time rock band, rips along. The characters are complex and real. And along the way, deeper themes are explored, including great debates about religion and service to country. Both are handled with a deft touch, enhancing the story without being preachy. These are real people who have been dropped into an intense situation that forces them to consider some heavy issues if they are going to survive. This book is okay, not great but not bad. However I was, & still am, looking for the old Robert McCammon books & his wonderful writing style as in Swan Song & so many others. It has been a long wait. I guess the author got tired of writing the supernatural into his stories. They are just a bit flat anymore & I thought he was one of the best writers around of that genre. It rocks and it rolls, it never leaves you cold. This story is gritty and shows the range of its author. He has amazing talent and can encompass such a great number of subjects. Robert McCammon is a uniquely talented writer, who gives a thrilling experience in every book.